vw | Why you drive bad?! 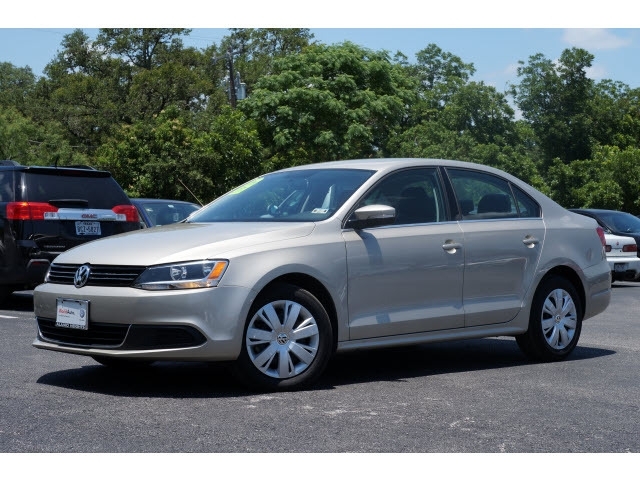 The other day I had to take my car in for repairs and received a brand new 2013 Volkswagen Jetta 2.5 SE as a loaner. I was not too impressed with it. I remember test driving a previous generation Rabbit and Jetta a few years ago and those were good cars. The older model felt solidly built with nice materials. The new Jetta just felt hollow and it could be felt in minor parts like the turn signal and shifter, which was surprising. This Jetta was equipped with a 2.5L inline 5 making 170 hp and 177 ft-lbs of torque. The 2.5L accelerated the car quickly with all the torque. It helped that the car weighed around 3000 pounds. Handling around the corners had minimal float and stuck to its course like it was on rails. It had a nice tight turning radius as well. I couldn’t tell that it had a non-independent rear suspension, but then again I didn’t try and push it very hard either. My loaner was equipped with the 6-speed automatic transmission, which felt like a nice break from driving a stick. The transmission in this car is probably the best automatic transmission I’ve ever driven. It shifts very smoothly under normal driving. Downshifts are lazy like any other automatic transmission, but it’s not jarring unless the accelerator is floored. The gears are spaced close together so it doesn’t feel like it’s losing a lot of steam during the shift. Sixth gear on the automatic is geared close to fifth gear on the manual so the closer gears are better. The car has a nice feature where there is a detent on the lower 25% of travel on the accelerator. When the pedal hits the detent, you can push the pedal a little bit harder and the car goes into ludicrous speed! As much as I wished it went plaid, the extra 25% of pedal travel just activates the transmission kick-down (drops it from 6th gear to 3rd gear for extra acceleration). The shifter has a manual-shift mode which was as lame as all other automatics with manual shift. I suppose it’s useful for hills, but for daily driving in traffic it’s not that fun. I just left it in drive and let the computer shift for me because that’s what automatics are built for: to drive mindlessly through traffic. The shifter also felt too light which made it feel as if I was playing Daytona USA in the arcade. The interior felt cramped inside since I’m used to driving a bigger car, but the seat was comfortable. The seats were “leatherette”, which is vinyl made to look like leather. In the 100 degree Texas sun, that thing burned as soon as I sat down! That is why I don’t buy cars with leather/vinyl seats. The air conditioner was also one of the weakest A/C units I’ve ever had to deal with. On Max A/C, it was blowing a good amount of air, but it wasn’t very cold. It’s interesting that the larger Passat with the same engine has a much colder A/C system. The Jetta is good basic transportation. It’s designed for those that don’t need the latest, greatest, flashiest gadgets. It’s a basic car. It looks and operates like a car without much complication. The 2.5L and 6-speed automatic have been around for years and have been proven to be reliable units so it is likely that the car will last a while. The styling, while a little conservative compared to its contemporaries, will probably not be dated in a few years. However, it does not feel too competitive with the current crop of compact cars. It’s not even very competitive with the last iteration of the Jetta. The quality of materials aren’t there, but the fit and finish still is. I considered buying a MK6 (2011-2013) Jetta once, but the lack of some features and the overall cheapness of it compared to the MK5 (2006-2010) Jetta was just too much of a bummer. It is a nice rental car if you can get it.